Switchgrass biomass left over after seed harvest had little value for Ernst Conservation Seeds until the company began using it to manufacture pellets. Switchgrass pellets. Photo credit: Calvin Ernst. Ernst Conservation Seeds in Meadville, Pennsylvania has been growing and marketing grass seed for more than fifty years. The company has always been dedicated to conservation plantings using native species, and recently cultivated a market for the biomass that remains in the field after seed harvest. When seeds are harvested, the stripped switchgrass remains in the field. Until about a decade ago, this leftover warm-season grass was simply burned off or sold for animal bedding. Then the company built a mill for manufacturing densified pellets from it. These are now being sold to the oil and gas industry for use as an industrial absorbent, and have the potential to reach other markets as well. Bales at field edge. Photo credit: Calvin Ernst. Besides making useable products, the mill could be a model for others considering getting into biomass production and is an important part of a developing infrastructure in the renewable energy supply chain. “We wanted to prove the concept that native grasses could become an economical source of energy or fiber,” said Calvin Ernst, president. Calvin Ernst founded the company in 1964 to grow and sell crown vetch (a low-growing vine) for erosion control. In the 1980s, he began transitioning from grains and nonnative forage seed to native grasses, mainly for conservation uses. Today, the company produces switchgrass, big bluestem, indiangrass, little bluestem, Virginia wildrye, and cordgrass, all of which can be pelletized for fuel or absorbents. It also grows seed from nearly 400 other species of native and naturalized grasses for a wide range of uses and markets. It’s a decidedly family business, with Ernst’s wife, Marcia, playing a crucial role from the beginning. Today, their three children are also involved. Besides pellets, Ernst has other interests in renewable energy, including selling some switchgrass seed for cellulosic ethanol research and production. “I think native grass biomass and forages hold a lot of potential, particularly when you look at the value of other ecological services that they provide such as wildlife habitat, nutrient uptake, water purification, and carbon sequestration,” Calvin Ernst said. Tub grinding bales. Photo credit: Calvin Ernst. Designed and overseen by Calvin Ernst’s son, Michael, the 10,000-square-foot mill began production in 2012. Three years after opening, the $6 million mill pelletizes and processes over 10,000 tons of grass and hay per year, with the capacity to pelletize as much as 30,000 tons. 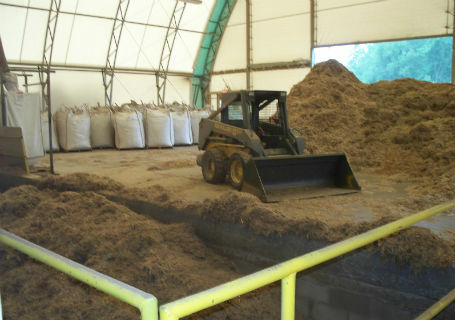 The native grass seed production is within a 20-mile radius of the pelletizer, which is operated under the name Ernst Biomass. To secure biomass for the plant, Ernst mows and windrows the straw after harvesting seed from its 5,000 acres of native grasses. 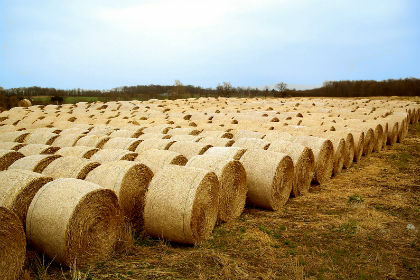 In the spring, the straw is baled in round bales that are stored at the edges of the fields until they are transported to the processing plant. 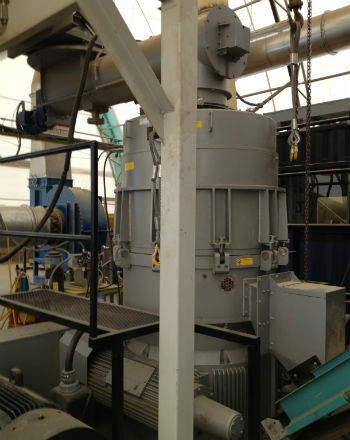 The material must be dry for baling, but the mill also has the capacity to dry the biomass after it is delivered to the plant. Ernst also purchases hay from local growers to increase the plant’s utilization. Ground straw going into the feeder. Photo credit: Calvin Ernst. Ernst experimented with several products before settling on pellets. It researched mixing paper and cardboard waste with warm-season grass. 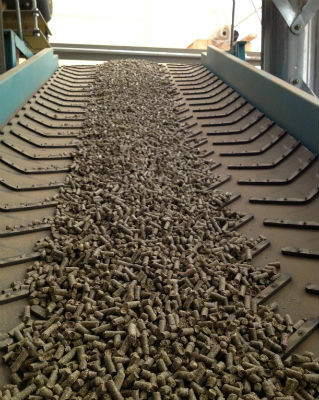 It also produced switchgrass briquettes for a Pennsylvania school district for two years and made several truckloads of briquettes for co-firing with coal. “Our experiences proved that we could not make a consistent product without a switchgrass straw dryer. By drying the straw for our pelletizer, we now produce a premium dry product with good quality control,” Calvin Ernst said. The dryer came only after a fourteen-month wait for a state DEP permit. 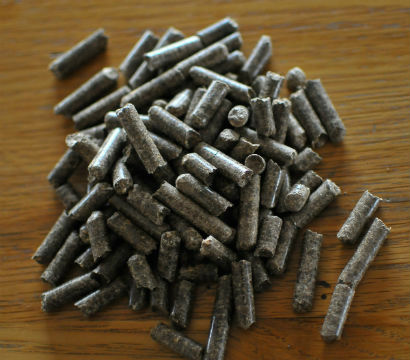 Briquettes worked successfully for co-firing but had limited use in the industrial absorbent market, where the pelletized product shines. Fortunately, Pennsylvania’s recently reinvigorated oil and gas industry increased demand for industrial absorbents just as Ernst’s pellet production came on line. Now most of Ernst’s switchgrass pellets are used by that industry to stabilize liquid waste in drill cuttings, making disposal easier. Ernst also sells some ground switchgrass and large, soft pellets for animal bedding. It’s constantly improving the plant’s efficiency by increasing the capacity of conveyors and grinders while seeking new markets—which might include energy production. Pellet mill. Photo credit: Calvin Ernst. Between them, Ernst Conservation Seeds and Ernst Biomass employ 75 full-time workers, 15 of them in pellet production. The mill also benefits the local economy by offering some income to landowners within 20 miles of the plant who lease their farmland to Ernst. Though few local growers have yet been willing to invest in planting and establishing their own switchgrass stands, Ernst expects interest to pick up now that there are better established markets. The expiration of contracts in the Conservation Reserve Program, a U.S. Farm Service Agency program that pays landowners for conservation practices, should also make more acreage available for native grass production. Ernst continues to think big. “Our goal is to plant an additional 1,000 acres of native grasses this year to produce seed and better utilize our biomass plant,” Calvin Ernst said. Pellets going to bagger. Photo credit: Calvin Ernst. This report has not been peer reviewed and the authors are solely responsible for the content.